Our Succession line offers a complete range of chocolate couvertures. A perfect alliance of tradition and technical skill, these chocolates are able to meet the needs of any chocolatier whether it be for coating, either full or hollow molding, ganache, mousse, etc. 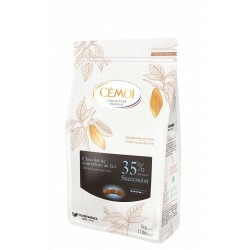 This line of chocolate couvertures is available in various pourcentages of cocoa and comes in 5kg packages. The small button pieces make it easy to use the right quantity and allow for quick melting.